Exiting the ferry from Seattle, continue on 305 north, past Winslow Way, toward Poulsbo. Cross High School Road and Madison Avenue at the Baptist Church, continuing to the next traffic lighted intersection. (Sportmans Club Road to the left and Manitou Beach to the right). Turn right onto Manitou Beach and take an immediate curve left. You are now on Madison Ave N. At the first stop sign, turn right onto Valley. Go downhill 2 blocks and turn left onto Kallgren. Go approximately 1 block to a row of 5 mailboxes on the left, with a green one (#11469) on the far end. Turn left onto the gravel lane. From my mailbox: Follow the lane uphill to the second property on the left. Park in the first, largest parking area (on the left in the upper picture). Park close to the edges and close together. If needed, additional space on the grass is available just before the parking area. Don’t park at the neighbors! 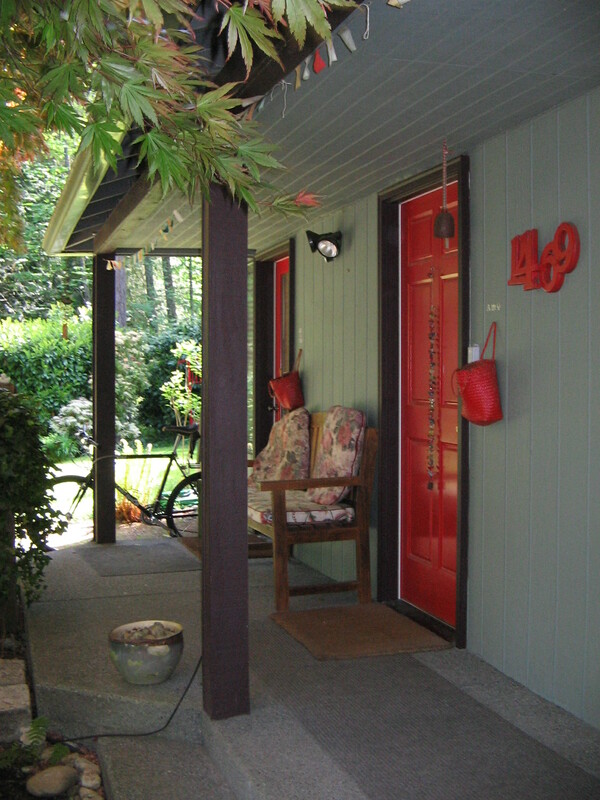 Walk up to the covered porch to the first red door. Take 305 across the bridge at Agate Passage onto Bainbridge Island . Continue past the Day Road intersection to the next possible left turn, Lovgreen. Turn left onto Lovgreen. Go uphill and cross Madison Avenue at the stop sign. At the next street turn right onto Kallgren. 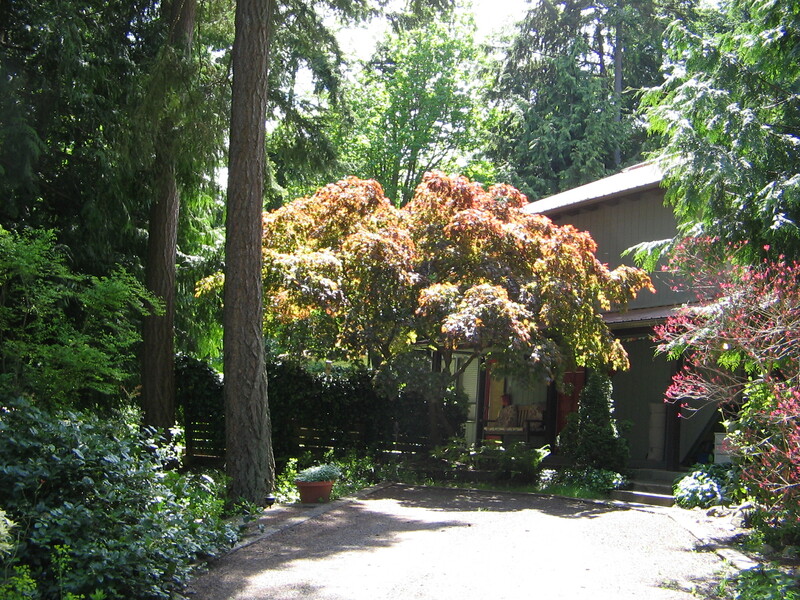 Go approximately 1 block past Roberts to a gravel lane with a row of mailboxes just beyond. The green mailbox facing you is #11469. Turn right onto the gravel lane. See above “From Mailbox”. Great site…..will be in Mt. Vernon for Tulip Festival April 24-27. Are you anywhere close to that area? Would you be interested in coming to Olympia to speak for a Sunday service? We are in our Open Pulpit process and I am in charge of finding the best and highest quality speakers over the next few months. We can offer you a $150 honorarium and a lovely brunch after church at one of our great waterfront restaurants. Please let me know if you are interested in coming some time over the summer, or even September. Hi there I am Frank, and I design amazing sites for my customers that concentrate on visitors with the search engines like google as well as change their site visitors into paying clientele for my client. I am reaching out to you to see if you are looking to make any changes or improvements on your site. Some of our clients want to make much more income with their site other folks are looking for a revamp. If you could tell me what you are interested in I could do a little research and provide you with an evaluation of the things we can do to suit your needs. This evaluation is entirely free of charge. If you’d prefer to chat just inform me what time you are free to speak in the next few days. I’ll supply the analysis and in addition explain to you some options that we have used for other customers who have produced a sizeable affect on their company. Hello Amy. This is Ginger Daire (formerly Reber). I believe we knew each other during the early 1970’s in Tampa. If I’m wrong, then please forgive me. If I’m right, I hope to hear from you.